Review posted August 26, 2017. Plain Truth Ministries, Pasadena, California, 2015. 330 pages. God is Good. God is Love. Life happens but redemption is coming. “The darkness is passing and the true light is already shining” (I John 2:8). 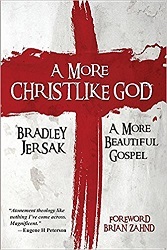 I ordered this book from Amazon because I had just finished a book on universalism that I loved, Flames of Love, by Heath Bradley. I was looking for another book on theology, and I’d enjoyed Bradley Jersak’s book, Her Gates Are Never Shut. I liked the description of this book. It turned out to be a wonderful choice. The Christian faith, at its core, is the gospel announcement that God – the eternal Spirit who created, fills and sustains the universe – has shown us who he is and what he’s like - exactly what he’s like – in the flesh and blood human we sometimes call Emmanuel (‘God with us’). Conversely, we believe Jesus has shown us the face and heart of God through the fullness of his life on earth: revealed through eyewitness accounts of his birth, ministry, death and resurrection. We regard this life as the decisive revelation and act of God in time and space. That’s still a faith statement, but for Christians, it is our starting point. To look at Jesus – especially on the Cross, says I John – is to behold the clearest depiction of the God who is love (I John 4:8). I’ve come to believe that Jesus alone is perfect theology. This does shake up some of the prevalent teaching about God. When I personally turned my gaze to the God who is completely Christlike, I was confronted with how un-Christlike the ‘church-God’ or even the ‘Bible-God’ can be. Setting Jesus as the standard for perfect theology, many of our current Christian beliefs and practices would obviously face indictment. Even significant swaths of biblical literature don’t line up well with the Christ of the Gospels. Claiming that God is revealed perfectly in Jesus triggers tough questions about the God I once conceived and preached. Jesus’ life and character challenges my religious clichés and standby slogans – especially the rhetoric of supreme power and irresistible force. Christ never reveals God that way in his teachings and especially not in his Passion (that is, Jesus’ arrest, trial, torture and death). Yes, he proves victorious, especially in his resurrection, but remember that Paul resolved to preach ‘Christ and him crucified’ (1 Cor. 2:2). you could resist him, you could mock him and beat him up. You could kill him. And we did. Our God is the cruciform Christ, the ‘weakness of God’ (1 Cor. 1:25) who is stronger than men. Why? Because he operates by overcoming love, not by overwhelming force. Jesus’ favorite image of God was Father (seventy times in the Gospels!). Jesus showed us in the Gospels what fatherhood meant to him: extravagant love, affirmation, affection and belonging. It meant scandalous forgiveness and inclusion. Jesus showed us this supernaturally safe, welcoming Father-love, extended to very messy people before they repented and before they had faith. Or better, he was actually redefining repentance and faith as simply coming to him, baggage and all, to taste his goodness and mercy. He didn’t seem to appreciate our self-loathing. The repentance he wanted was that we would welcome his kindness into our deepest needs and wounds. After all, this is what Jesus said about himself. Add to Jesus’ depiction of God as Father his startling Last Supper announcement, “If you have seen me, you have seen the Father” (John 14:9). Somehow we need to let his words jar us again. Maybe we’re too used to the phrase, but it’s what I’ve hinted at in the title. For our own sakes, we might take a break from trying to convince ourselves that Jesus was and is God and to spend this twenty-first century meditating on the truth that God is like Jesus. Exactly like Jesus. This book explores the ramifications of this observation. And the result is truly beautiful, as the subtitle promises. Now there’s a whole lot in here that’s wonderful. I’ve marked many sections to add to Sonderquotes, and while I was reading it, I couldn’t stop talking about it with some of my friends. In the next few chapters, we will begin to explore the grand mystery of how a kenotic, cruciform and Christlike God can reign – can be present, active and ‘sovereign’ – in the world, when he is neither coercive nor controlling, but nevertheless infinitely close and caring. We’ll notice together how such a God rules, saves and serves by grounding and filling all that is with the power of love – a divine love with a particular content defined as consent and participation. Further, we’ll see that we surrender to God’s reign, cooperate with the Spirit’s grace, and receive Christ’s salvation in the same way: by consent and participation. The fullness of God’s saving comes as God participates fully in the human condition – from birth to death – and consents to enduring temptations, trials and even the extreme humiliation of crucifixion. The fullness of our salvation comes as we participate in Christ’s death and as we fully consent - cooperate and surrender – to his grace. The book is full of the exploration of these ideas and what they mean in our lives. And it gets into big theological questions – and answering them by looking at Christ. In that sense, I say God is in charge, but he is not in control, because he doesn’t do control. Sometimes I wish he did, but as I scan history and humanity, I don’t see him controlling. Sometimes he seems and feels absent, distant and silent, weak or maybe even dead. Did God simply die and abandon us all to go to ‘hell in a hand basket’? No! Rather than control and coerce, God-in-Christ cares and consents to suffer with and for us. We don’t concede to the false image of a ‘lame duck’ dad who sits by silently, watching his kids getting beaten by the bully. Instead, we look to the true image of the cruciform - Christ himself – the One who heard our groans and came down to suffer and die with us in order to overcome affliction, defeat death and raise us up to live and reign with him. God sent Jesus into the world to announce the good news of peace, to turn us from wickedness and save us (from ourselves). Jesus was crucified (and sometimes, “You killed him”). Jesus is Lord and Saviour; he is making all things new. Now turn to this Jesus, entrust your life to him, and he will make you new too. Do you see how this outline follows the Passion story? No theories, no clever analogies. The gospel is what actually happened in space-time history. The facts. But the best part of this book is that the author really does “unwrath” the gospel. He shows that Jesus was not saving us from the Father. Jesus was fully God at the moment of his crucifixion. Somehow, we must affirm both truths: that Christ entered an authentic experience of our sense of abandonment and that he never ceased to be God, nor did the Trinity ever cease to be one. But further, where did we ever get the idea that God is too holy, righteous and pure to look on sin? Did it somehow escape our notice that God is everywhere and sees all things? If God was too holy to look on sin, would he know anything about anyone? In fact, did not Jesus walk, talk and eat with sinners every day of his life? Are we saying that Jesus was not God incarnate, fully God and fully man throughout every moment of his life? What Jesus saw, God saw – sin stains and all. I would challenge readers to find one instance in the four Gospels where Jesus casts the Father as the principal conspirator and punisher on Good Friday. Examine every instance of the gospel being preached in Acts (25% of the book!). See if you can spot even a single hint that God the Father was the culprit in the crucifixion. Yet, paradoxically, God did orchestrate our salvation through it. Even the Pauline language of God sending his Son as an ‘atoning sacrifice’ is a far cry from this picture of a retributive God turning from or lashing out against Jesus in order to fully satiate his wrath. God never turns away from humanity. God is perfectly revealed in Jesus. When did Jesus ever turn away from sinful humanity and say, “I am too holy and perfect to look on your sin?” Did Jesus ever do anything like that? No. The Pharisees did that. They were too holy and turned away. God is like Jesus, not like a Pharisee. The gospel is this: when we turn away, he turns toward us. When we run away, he confronts us with his love. When we murder God, he confronts us with his mercy and forgiveness.